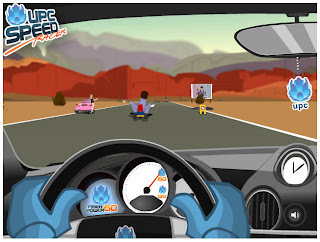 We've just finished working on a racing game in flash for UPC, a big Cable internet company in Holland. Technically the game is a nice mix of optimization and user (designer) friendliness. My Collegue Martin Strieder was responsible for all the artwork, and I did the all the programming. This gave us a BIG performance boost during the game. Since this is a pretty cpu intensive game, I've also added a framerate watcher, which will turn down the renderquality of flash a notch when it detects a low framerate. On my develop and testcomputer (which is a lot slower) this meant that I could keep playing the game at 30 fps.